Serena grew up on acreage in the lower mainland of BC with a plethora of animals, including cats, dogs, rabbits, sheep and pigs. After completing a Bachelor of Science in Biology and Psychology she worked as a zookeeper and volunteered with a mixed animal veterinarian, which drove her towards veterinary medicine. 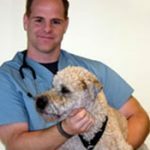 She upgraded her studies at the University of Calgary completing a Bachelor of Science in Zoology and was then accepted into the Western College of Veterinary Medicine in Saskatoon. During her time in vet school, she also began a Master of Science degree in large animal reproduction. Following completion of her Masters in July 2017, Serena decided to move to the Greater Toronto Area to be close to her sister and two adorable nieces. 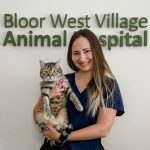 She is pleased to be working alongside Dr. Chris O’Toole at Bloor West Village, and has a special interest in cardiology and colour Doppler ultrasonography. When she is not in the clinic or hanging out with family, she is doing Brazilian Jiu Jitsu, weight lifting, or aerial circus arts.